The Dow Jones plunged sharply yesterday, losing 250 points to 12,570, as the index recorded its second largest fall of the year so far. This came largely on the back of increasing signals that the global economy is heading back into recession. Not only did we see declining sales of existing US homes, we also saw weaker manufacturing numbers and higher than estimated claims for jobless benefits. In addition, dire Eurozone manufacturing numbers and a worse than expected German services survey were capped off by contracting Chinese manufacturing output. This plethora of poor economic data was then compounded by the credit ratings agency Moody's downgrading 15 of the world's largest banks. The downgrade to all these banks, even those that are partially government owned, highlights the fact that banks remain risky assets for shareholders to hold. In addition, it serves as a reminder of the serious difficulties that they continue to face in what is becoming an increasingly hostile economic environment. Regulators are splitting them up and imposing more stringent capital rules. Banks are having to hold more in reserve whilst, at the same time, they are being told to lend more to businesses in order to boost investment and growth. This move by Moody's doesn't help matters as it'll only make bank funding more expensive. However, at least the move wasn't a complete surprise and none of the banks suffered a huge slash to their ratings. All this negative news has stifled the recent strength in equity markets and, once again, shows the fragility of the global economic situation. Naturally this has led to a bout of risk aversion this morning. The weak sentiment is affecting all assets classes, even traditional safe havens such as gold. The FTSE is currently at 5520, lower by some 45 points, and is testing near-term support. A break below 5500 could open up the way for further weakness to 5430 and possibly 5380. To the upside, resistance is seen at 5560 and 5610. So we got some more twisting from the Fed last night but financial spread betting investors were a little disappointed at the lack of QE3. After the announcement, American shares did come off their highs but not significantly so. Even though we didn't see any further easing, the US economy doesn't seem to warrant it just yet. The world's biggest economy is slowing, as the PMI surveys, confidence data and employment numbers indicate, but it's still in better shape than most. Therefore, whilst the commencement of QE3 would have been welcomed by gold and stock market bulls alike, the rally might not have lasted that long. In the past few years we've seen stimulus, such as quantitative easing, only give economies a temporary boost. In the case of the US, this has been a much bigger boost than in UK, where our economy has simply been brought back to a flat line. The problem is that the US hasn't been on an austerity drive. As their debt bubble gets bigger and bigger, they may eventually be forced into cutting back. But the real difficulty will be coming off the drip feed of QE. As the effects of each round wear off, central banks will feel the urge and political pressure to undertake other measures to help boost growth. This dangerous spiral could easily take us down the route of Japan where anaemic growth will simply be a thing of the norm. This morning sees a little bit of profit taking in European indices following on from the mild declines in the US. The FTSE is 30 points in the red, currently trading below the 5600 level at 5590. Those clients who'd been selling into the rally of the past few days will be pleased to see a respite in the FTSE's recent strength. There is a lot of economic data to watch today, with PMI numbers from Germany and the EU, and retail sales from the UK. This afternoon we will see the US weekly jobless claims, home sales, Phili Fed and, finally, the EU consumer confidence numbers will round things off. Already this morning we've seen the German PMI services number come in lower than expected. This is contributing to the slightly bearish sentiment in the markets as it shows that even Europe's powerhouse is not immune to the fallout from the Eurozone. The last two months has seen inflation fall off a cliff, much to the delight of consumers. Many have been suffering from falling real incomes and will continue to do so despite the recent weakness in inflation. Wage inflation remains below the rising prices but, as long as oil prices remain under pressure, we could see further falls. The declines in crude show just how much affect it has on the rate of inflation and consumers will be hoping that these price drops continue. You never want them to go too far, however, as the worst case scenario would be deflation. We nearly suffered from declining prices during the fallout from the banking crisis. However, thankfully, this was avoided. Any deflation would have made the recession even deeper than it was. In the past couple of months, prices have fallen at a faster pace than the BoE had expected. This does just raise the prospect that we might see inflation fall to below the BoE's target. A fall in crude oil futures maybe good for some economies, but it isn't so good for others. Back in 2008 and 2009, crude crashed from around $150 a barrel to almost as low as $30. The economies that were/are dependent on high oil prices suffered severely. In particular, Russia saw a booming economy slump into a very deep recession. For the Russians, crude prices below $100 a barrel are not a good thing. This is especially true given that President Putin's extensive spending plans are so reliant on high prices. Brent and Nymex crude have been particularly volatile of late and they remain a good indication of risk appetite. Interestingly, whilst the FTSE 100 and other indices have put on impressive gains so far this month, oil has declined by over 6%. So whilst the FTSE 100 has seen a rise of over 5% so far in June, it hasn't been down to the heavyweight mining and energy stocks which have been really sluggish. This morning, the FTSE 100 is just in the red after yesterday's strong gains and investors are waiting to hear what the central banks have to say. The BoE will be releasing the minutes of its latest interest rate decision this morning. Investors will want to know what they have to say about the recent fall in inflation and the prospects for UK growth, but also whether it's likely they'll add another round of QE. Today's major event will be the FOMC meeting this afternoon, where they are expected to at least extend Operation Twist or even go a step further with a third round of QE. If we see neither of these outcomes then the bulls could be very disappointed. The ongoing turmoil in the Eurozone may convince the Fed to extend Operation Twist, i.e. selling short-term debt and buying long-term bonds. Speculation of more QE has supported a rally in the Dow Jones and the markets have been entertaining the idea of more stimulus for a few days. Whilst investors remain unconvinced that an end to the Eurozone crisis is in sight, at least we can rely on the G20 summit in Mexico to solve all our problems. Of course this would be wishful thinking, but at least politicians seem to be waking up to the fact that the issue needs to be properly addressed. If sufficient action is not taken then the western world will be in for a few years of sluggish growth. This could be the beginning of the end of western dominance of global demand. The focus of this G20 meeting will be around growth and the stability of the euro. However, this time around there has been a little bit of preparatory work ahead of the summit. Since the focus had been previously agreed and discussed by everyone, more time will be spent on how to actually go about it. Unfortunately, as has been the case so many times in the past, it is rare for anything meaningful to come out of these summits apart from the usual photographs and back slapping. The optimism regarding the Greek election result, where pro-Europeans won a small victory, tempered some of the ongoing concerns but proved to be short lived. The Dow Jones fell by 25 points to 12,741, as markets continue to doubt that there's been any fundamental change in the European debt picture. Also weighing on the Dow was the fact that Spanish borrowing costs continued to surge to record levels. Spain will remain in the spotlight as they go to the bond markets twice this week. With the first auction coming up today, and the second due on Thursday, investors will be keen to see just how much the market demands in return for lending the cash. The FTSE is in a positive mood so far today as a bit of optimism surrounding the G20 seems to be creeping into the markets. Ever since the Greek election, markets have remained quite volatile but the bias has not been heavily to the downside, rather indices remain reasonably well supported. After Monday's reversal, some Financial Spreads account holders have been creeping in to buy the FTSE and they are sitting pretty at the moment. The London index is currently at 5530, with the bulls just in control. Despite the turmoil in recent weeks, June has seen the FTSE move some 3.5% higher. To the upside 5570 and 5610 are seen as resistance levels in the near-term. Despite the early sell off, indices spread betting markets are still marginally higher than Friday. For the DAX 30, there are some pretty solid resistance levels above us at 6345/55 and 6435/45. These levels could be bolstered by the fact that we are unlikely to see any highly positive economic data in the near-term. Support is at 6220/30 and below here is the volume area of the last few weeks, all the way down to 6070/80. Below here, traders will be fearful of a return to the recent lows near to 5900. Since I started writing this article, the FTSE 100 has slipped into negative territory for the day and is looking pretty weak. At one point it hit short-term support at the 5460/65 level but sentiment doesn't seem to be favouring a rally just now. The current level is almost the mid-point of the last two and a half years of trading. In addition, the 5500 region is generally seen as a short-term point on the way to somewhere else. If we can actually manage to get above 5500, and hold it, then some of the technical indicators may begin to turn positive. Recently, however, we have been unable to close above this level despite moving about in intra-day trading. Index markets are looking solid this morning, which is not surprising given the overnight announcement of banking stimulus from the BoE. It is likely that this type of attempt to create liquidity further down the food chain will prove to be soothing in the short-term. In fact, this seems to be better than the rather hopeful QE policy, which only lightened the load on banking balance sheets rather than encouraging lending. A problem for the UK stock market, which has received little in the way of press commentary, is the increasing frequency of corporate profit warnings. These are impacting individual equity prices but do not appear to be harming the overall market at the moment. Investors should be concerned enough to keep an eye on announcements. If the trend continues then it might be picked up in overall market expectations. Today see the options expiry which might create a bit of excitement at 10.30 and traders should beware a spike in prices around that time. This morning, the FTSE has pushed up to the 5500 level which is often considered to be a sort of staging area on the route to somewhere else. Over the past two and a half years, the 5500 level has seen little consolidation activity. However, it has seen brief visits in a bear/bull move. Also, in 2011, it was the immediate support in bear spikes. Bulls will be hoping that history repeats itself and the markets continue to the upside, with a reasonable initial target of 5545/50 and then 5785/95 as a longer-term goal. Bears, of course, will be anticipating the opposite, with 5475/80 being the first target and then the 5400 area which has proved to be so pivotal over the last couple of weeks. US markets have also been climbing, with the Dow in the midst of the big resistance/support area of 12710-35. A push above this point may bring in fresh buyers but, if we spend too long waiting for the move, we could see disappointment drag us back down. Last weekend, some of our clients had an unexpected windfall after the markets surged when the Spanish 'banking bailout' was trumpeted by the weekend press. In contrast, other clients had a terrible time as the price gaps handed them a painful lesson in risk/reward. As a result, we can expect to see quite a bit of position flattening over the next 48 hours. The Greek electorate will soon decide between a quick execution and a long, lingering death spiral. The major problem is that we really don't know how the markets will react to either result. Plumping for a quick exit might actually be taken positively, as at least a decision would have been made. Also, if the ensuing chaos is serious enough, it may bring other nations to their senses over their respective fiscal responsibilities. I wouldn't hold my breath, though. Growth is likely to be elusive over the medium to long-term as more and more funds are diverted to propping up the status quo. In the UK, this situation is mirrored by the huge pension deficits of corporate Britain. Many companies will be forced to divert ever increasing sums into the respective pension pots, taking it away from investment and sales. With the BoE looking likely to press the QE button once again, the swings and roundabout similes will have another day in the sun. The effect of the BoE driving down Gilt yields even further, to release liquidity needed elsewhere, will be matched by UK plc pulling in its new investment plans another notch. Oddly enough, equity yields are looking exceptionally good right now. If you consider all the potential liabilities, it could be argued that the average company is in a better fiscal position than almost any OECD nation. Shares markets may well suffer badly in a collapse of the EU project. However, many investors are operating on the assumption that politicians and central bankers will print any amount of money to hold their shining achievement together. In this environment, we might conclude that the huge piles of investment cash waiting for a home might start to dribble back into play. The FTSE is opening on the soft side this morning but not exceptionally so. There has been some early volatility as the opening few minutes saw a thirty point rally, followed by a fall, followed by a rally etc. Investors are trading over shorter and shorter time periods, with many of our spread betting account holders closing out short-term profits/losses within minutes of opening them. In truth it is difficult to argue for taking a longer-term view on indices. Direction is becoming so uncertain that a healthy profit can disappear very quickly, often for no obvious reason. We are pretty much in the middle of the week's move, having been 100 points higher and lower, and almost exactly where the FTSE futures market closed on Friday night. There is resistance on the short-term falling trend line at 5480, which we did see earlier today, and then at 5505/15 and 5570/75. On the support side, levels to watch for are 5430/35, 5405/10 and 5380/90. The US markets are equally spooked but there does seem to be a greater appetite for buying stock, aside from Facebook of course. We are even seeing some longer-term players making a few high profile investments. The Dow Jones is immediately supported at 12,510/25 and then 12,475/85, which is also the short-term rising trend line. The 12,400 level is stronger support, as the Dow has bounced off here a couple of times this week, and then the 12,320/30 area was the support at the end of May. The FTSE staged an impressive gain yesterday, despite Spanish bond yields rallying to their highest level since the euro began. The rising yields show that bond spread betting investors are unconvinced that last weekend's bailout will be enough to prevent the contagion from spreading. However, the FTSE's rally also indicates that there are plenty of bulls who believe that, if you put all the negativity to one side, shares still represent a worthwhile investment. Certainly, the extent of the sell-off we've seen since April could be enough to tempt any investor into dipping their toes back into the stock markets. Those that are buying at these levels are betting that, if contagion is averted, we could see a quick rally back towards the highs of the year. Other bulls are betting on the prospect of further stimulus from central banks, which is becoming all the more likely as growth around the globe is slowing down. However, past experience doesn't seem to have acted as much of a lesson to politicians and central bankers; extra QE will just push the problem further into the future. Yes we may see a short-term boost to growth, but at the same time it will probably push up commodity prices, causing inflation to spike again. The western world looks like it is slowly going down the same route as Japan. However, if we are in the midst of our own 'lost decade', at least we're nearly halfway through it. 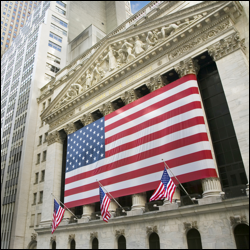 The Dow Jones reversed course yesterday, moving 160 points higher to 12,573. This came on the back of speculation that the Federal Reserve will take measures to boost growth. Additionally, a Fed official expressed his support for plans to speed up job creation. Last but not least, in yet another effort to solve the debt crisis, the European Central Bank backed a plan to guarantee bank deposits. The optimism from the US has filtered through to this morning's European open, with the FTSE ticking higher and knocking on the door of 5500. In the near-term, the 5550 level remains the next major resistance for the bulls to overcome. Optimism regarding Spain's rescue plan evaporated rather quickly yesterday as investors grew sceptical over the goal of reducing the troubled country's debt. Given the size of the two economies, speculation that Italy might be next in line for a bailout fuelled doubts over whether this kind of approach can succeed. As a result, the Dow Jones fell 140 points to 12,411 unable to shrug off ongoing fears about Europe. This is the real problem at the moment in that it's Europe dominating the financial markets. Yesterday, we saw a swift reversal in the fortunes of equity investors as Spanish bond yields spiked the most in four months. If ever there was an indication of scepticism over a bailout then this is one. Now we see that the fourth domino is likely to fall, not Italy, but a much smaller one in the form of Cyprus. This is not going to exactly spook the markets but is more symbolic for a Eurozone that seems to be falling apart. And you can't ignore Italy either as it is the next big worry. Investors in Italian stocks showed that concern as the Italian stock market fell over 2% yesterday and is down almost 1% this morning. For Spain the big issue is that the situation has created a vicious circle. The state is bailing out the banks that own its debt. Following the LTROs from the ECB, Spanish banks gorged themselves on their own country's bonds whilst other private investors stayed away. Therefore we now have a position where the potential for the country defaulting is fast becoming a reality and it's their own banks that will be hit the hardest if that occurs. At the same time EU politicians still insist on introducing a financial transaction tax that will cripple the banks even further. The FTSE 100 rolling daily market was being called to open 10 points lower this morning but it has opened 10 points higher at 5442 as the see-saw action looks set to continue. It's clear that the Financial Spreads clients were finding trading conditions tough yesterday. With so little in the way of corporate or economic data for the rest of the week investors are likely to focus on the Greek vote this weekend. However there is manufacturing and industrial production data from the UK this morning. This is expected to paint a mixed picture but show that the UK's manufacturers are neither in the worst nor the best of shape. They'll be delighted to see oil prices tumbling and have seen the input prices tumble recently. Nevertheless, across the Channel, their biggest customers are in dire straits. So another domino falls to the Eurozone bailout facility as the rumours that Spain would go cap in hand to the EU became a reality. Index spread betting investors are breathing a huge sigh of relief as European markets have jumped on the open, moving even higher than our original estimates. However, there are still lots of unanswered questions about how this particular bailout will work and whether it will prove to be the right solution. If history is anything to go by, bailing out banks doesn't work in the short term. We only have to look at the struggling share prices of our own nationalised banks to see that. The severity of the banks' problems has been vastly underestimated and we can see that the answer from politicians is, once again, to throw good money after bad. At least these bailout funds have been specifically set up for the purpose, but at the moment it is unclear which bailout fund will be used. Will it be the EFSF or the ESM? This will make a big difference because of the seniority that the new bonds will have compared to other private debt holders. If the ESM is used then private debt holders will be moved down the pecking order if things go wrong. Some EU countries are also looking to ratify the bailouts and so another hurdle has been put in place. As another €100bn is piled onto Spain's humongous debt mountain, their ability to ever repay it hinges on a rebound in their economy. Unfortunately, the country is unlikely to see a quick return to the necessary levels of growth as unemployment remains elevated and the housing market is continuing to tumble. It will be interesting to see whether this morning's rise in equities can be sustained, as the focus will soon shift back to next weekend's Greek election. And let's not forget the next big elephant in the room, Italy. Just as the Spanish and Italian football teams could not be separated over the weekend, the countries' budgetary problems are very similar indeed. If Italy's ten year government bond yields start heading back above 6%, alarm bells will start ringing once again. The FTSE 100 spread betting market has opened in a very bullish mood this morning, rising by over 1.5% to 5525. We can expect today's trading to revolve primarily around the Spanish bailout as there's very little economic data scheduled for release.